Tuscany is acclaimed everywhere for its superb wines, but in the last years a certain interest for beers and brewery has arisen, thus we have decided to go around to discover the microbreweries of our Region. 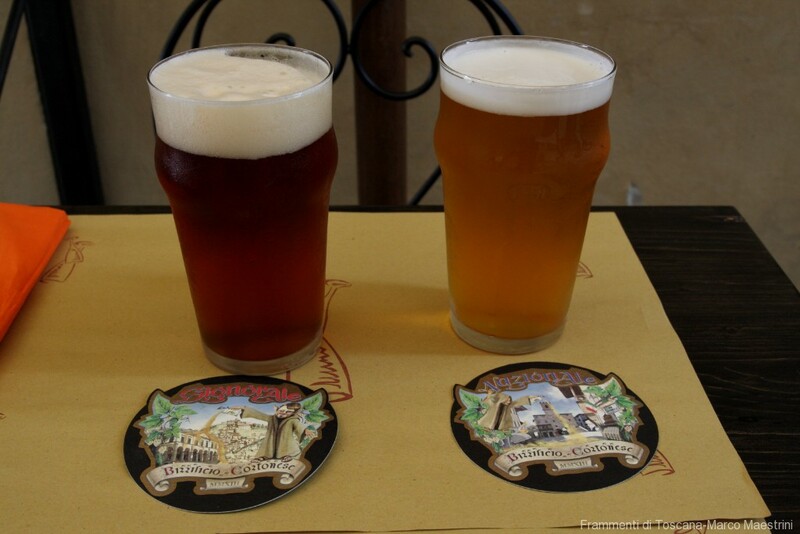 We confess that we love beer, and we are really enjoying our discoveries: after the visit to the “Birrificio San Quirico” in the Val d’Orcia, during our last trip to Cortona we took the opportunity to taste the wonderful beers of the “Birrificio Cortonese”. 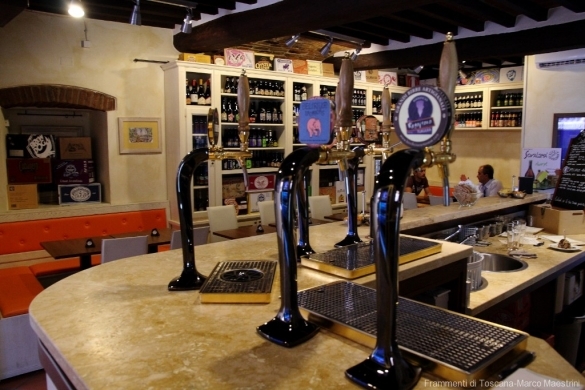 The Brewery is located in the centre of Cortona, in the Via Guelfa, a few steps away from the main square Piazza della Repubblica if you take the street going downhill on the left of the Palace of the city hall (the one with the imposing staircase that dominates the square). The place is therefore right in the centre, but at the same time a little off the beaten path, and preserves the authenticity that we love finding and recommending. The brewery is open from 11 a.m. till late night; we had lunch outside on the veranda, as the weather was still really pleasant where we was there. The “Birrificio Cortonese” isn’t just a beer pub, but a place where delicious starters, salads, pizza and traditional focaccia can be also ordered. We chose a nice salad and the German starter: a big dish with brezel, Black Forest Ham, wonderful cheeses – one soaked in beer – and salami. And now, let’s talk about beer: beyond the craft beers made by them, the brewery boasts a good variety of other Tuscan, Italian and foreign productions on tap and in bottle. We obviously opted for the ones produced by the house, and we had a great experience: we enjoyed a pint of NazionAle – blonde and fresh, with a slight taste of malt and fruit, refreshing and with an alcohol content of 4,8% ABV – and one of SignorAle – amber in colour, 6,2% ABV, produced with American hops, very intense and robust, my favourite one! Last but not least: the staff is friendly, competent and very nice, and both food and beers are well priced. 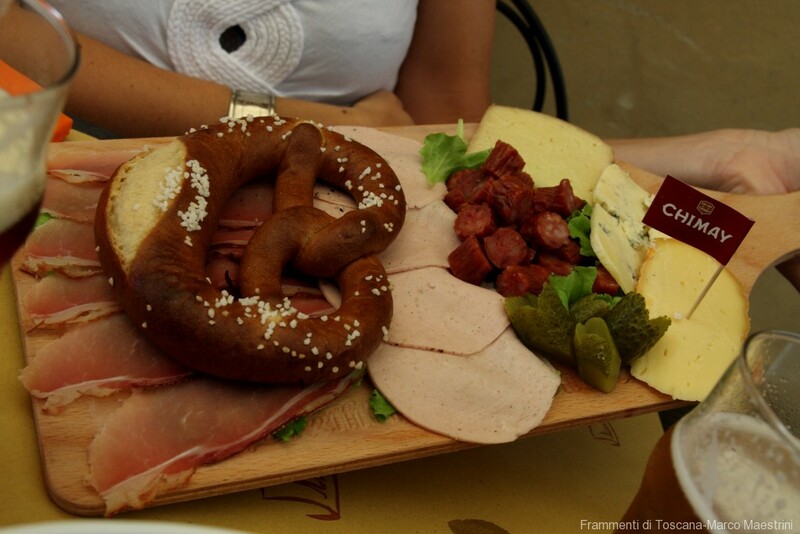 I guess this brewery, being a particular alternative to the traditional Tuscan restaurants, will be soon put in the “must do list” of many visitors in Cortona!